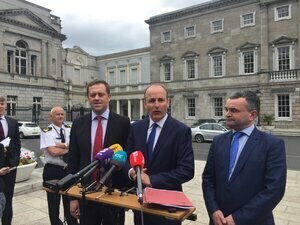 Fianna Fáil’s leader Michael Martin raised the alleged data breach at Independent News and Media and matters of editorial independence and independence of journalists. 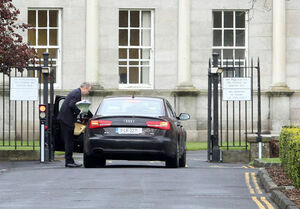 He said the recent events were a “wake-up call” for the Oireachtas to “deal with these issues”. Mr Martin mentioned a report published last year by Mr Justice John Murray about the protection of journalistic sources, called ‘Review of the law on the retention of an access to communications data’. Mr Martin said this report hasn’t been acted upon since it was published in April 2017 and called for a national law to be established for source protection. “Will you reaffirm to the house because I think something happened yesterday, whereby an actor of the State – the Director of the Office Corporate Enforcement was essentially, received correspondence that in line of his duty, he may be peronsally held liable in respect of certain things. 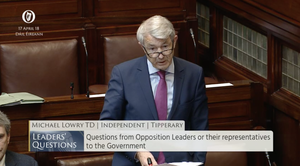 “I think it’s very important that the messages goes out from the Oireachtas and form Government that any actor of the State is indemnified and will not lose out personally in any way for conducting his duty on behalf of the taxpayer and on behalf of the State. “Thanks very much, deputy, for raising this important question and to answer yours, I think given recent revelations, yes we are going to have to give consideration to legislation in this area to protect sources. “I’m not aware of any legislation being drafted currently by Government and I haven’t seen any legislation drafted by Opposition, in the form of private members’ bills in the past two years but perhaps, perhaps time has certainly come for Government to dust down those reports and give consideration to legislation in this area. “I think having an Independent News and Media is a cornerstone to our democracy, it is after all the fourth estate. 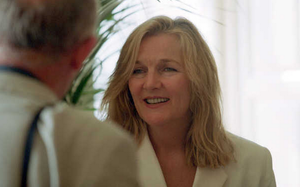 “I believe journalists must be free to pursue stories that they want to pursue. Their sources should be protected, free from any unjust interference, external or internal. “We need to the plurality of voices in the media. We need to ensure that these voices are not drowned our or silenced and we also need diversity and ownership. So I commend journalists who work to report on this story, including journalists at Independent News and Media who haven’t allowed their independence to be compromised. “A report of the data breach represent a significant a very significant threat to the freedom of our press, however I think that the way that the media has responded to this threat to date should reassure us that our press will not be silenced. “Obviously, any alleged breach of personal data is a matter of concern, heather it relates to journalists or public citizens and it’s important to say that although this is now a matter before the courts, we need to respect that and bear in mind that in terms of our contributions and I know the deputy has. “The Office of the Director of Corporate Enforcement, the ODCE, which is a Government office at the Department of Business has now made an application to the high court under Section 748 of the Companiess Act 2014 to appoint inspectors to investigate the affairs of INM. “This is now an enforcement matter for the ODCE. Section 949, subsection 3 of the Companies Act, provides that the Director of Corporate Enforcement shall be independent in the performance of its statutory functions. “That case commenced as of yesterday. Posted in Misc and tagged alleged data breach, INM, Leo Varadkar, Michael Martin at 2:56 pm on April 17, 2018 by Bodger. Thanks Daisy. Fixed that now. Apologies. Sorry, that wasn’t any sort of a criticism of yee Broadsheeters, but Leo’s Bull sheeting! Varadkar ‘thinks’ , maybe he needs to check with his boss before he can say more…. Nice attempt by lowry to change the subject, there’s no connection there at at all is there? And throwing in the urban/rural divide too. Didn’t the Healy-Raes tell us that it was the fairies. The divide’s not fupping wide enough. We need to unliterally declare Tipperary an independent livestockrapeocracy. The fact that this bozo is reelected every time does say something about the electorate in Tipp. More like take them out of the bin.. When people like Lowery get elected, as a nation we deserve what we get. How about a call for a national law for when a report is commissioned it MUST be acted upon, otherwise what was the point of the report in the first place other to waste time and money? That’d scupper the easy out of “I’m waiting on the report” responses. When the report is available, act on it or you’re all frikkin fired! The fact Lowry hasn’t been brought to court, let alone convicted, tells us all we need to know. As for Varadkar, a great man for saying ‘yes, we need to do that, I recognise the issue, I see the problem, something must be done derp derp derp’ without ever actually doing a tap. We sure do deserve these clowns. Maybe if the early riser had a lie in things might get done..
Leokins just can’t help himself – has to choose phrases to try rub people’s noses in it. Knows his master is looking on, and thinks he is gaining kudos. He is no Kenny, Lowry, Noonan. He is in for some shock. What has this guy actually accomplished in any office, taoiseach, ministerial portfolio or td?? No Kenny, Lowry or Noonan? Hopefully you’re not suggesting that those vassals are something to aspire to? 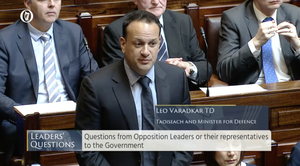 As for Leo the longer he’s Taoiseach the more smacked-arse his face becomes. The roads are poo poo in fairness. and lay’ve the women of Ireland look after their own wholes. remove Marian from the speed-dial – btw, phones are provided so that can easily be managed.